Back in August 2009 I set myself the challenge of building a Dave Alexander class 15 kit before we went on holiday over the Bank Holiday. So with the kit in hand and a Mashima 1020 motor on order I got out my temperature controlled soldering iron. The kit was from Dave’s original range and consists almost entirely of whitemetal castings, including the bogies. I started soldering up the frame and bogies, making sure clearances were there to allow it to go round corners, a bit tricky with the sandboxes in place. Once the motor arrived I fitted it to the power bogie. The kit is designed for a DS10 but the Mashima 1020 fitted in easily with a bit of shimming underneath to get the mesh right and a plasticard packer on top to hold it down. Once the chassis was sorted and running round the layout I continued building up the bodyshell, again soldering everything, not a drop of glue used before primer was applied. Basic construction completed in 7 days. Following a coat of grey primer and some minor filling and rubbing back the door handles, handrails and route indicators were added – finally resorting to the superglue. The body was painted with Halfords Rover Brooklands Green and buffer beams brushed with Humbrol red enamel. The cab ends were painted with a mix of Airfix M20 Cockpit Green and matt white enamel to get the right shade. The bogies and underframe were sprayed with satin black car spray. 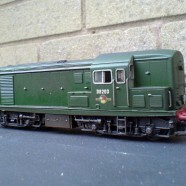 18 days gone and I had a well built, smooth running, DCC fitted loco that just needed a bit of finishing. So I did not quite meet my deadline, but after a break in Somerset (right next to the West Somerset Railway) HMRS transfers were applied, handrails painted silver and a touch of weathering bounce sprayed from a can. I had myself a loco that runs well on my exhibition layout for about half the cost of an out of the box Heljan version and before that was in the shops too!